Juan Bobo, which translates to “Simple John”, is featured in a series of humorous folktales from Puerto Rico. The story is retold by Arí Acevedo-Feliciano. It is a classic tale about a mother and her foolish, young son who lacks common sense. One morning, Juan's mother asks her son to take care of their pig while she goes to church for mass. While she is gone, Juan hears the pig squealing and grunting, so he thinks that the pig is sad because she wanted to go to mass, too. In an attempt to be helpful, he dresses up the pig in his mother's clothes and jewelry, then he sends her off to mass. When Juan's mother returns from church, she is furious when she discovers the pig rolling in the mud with what is left of her dress. Still, Juan just doesn't understand why the pig never made it to mass. 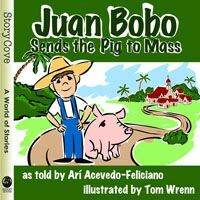 The popular phrase, “Putting lipstick on a pig,” comes from this classic Puerto Rican folk story of Juan Bobo dressing up the pig for mass. This story offers valuable life lessons about taking responsibility for our actions, being resourceful while becoming trustworthy and dependable. Although Juan's intentions were good, his actions resulted in disaster when the pig destroyed his mother’s dress and trashed her jewelry. Of course having good intentions alone isn’t always enough and his actions led to a disappointing outcome – something that all of us can relate to.